speedometers is from original sales literature. hooked up from the illustrations provided. them for others to see. Note for Firefox browser users: Firefox's built-in PDF viewer does not view the following PDF documents sufficiently. To change your viewer to Adobe Acrobat, please follow these directions. Sears-Cross Centrifugal Speedindicator, "There will be more CENTRIFUGAL SPEEDINDICATORS used in 1915 than all other types." Veeders were used on the earliest cars without a speedometer; they were popular with bicyclist before automobiles to record mileage as an odometer. 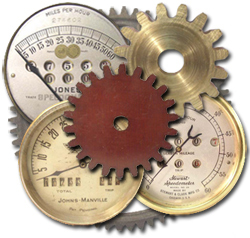 Later some speedometers incorporated Veeders for odometer purposes, notably on the earliest Warner, Stewart and Jones speedometers. Note the Veeder speedometer and tachometer units and the hook up components illustrated. These are very rare.